Undoubtedly, Dubai is among the few destinations that has the classiest, trendiest and the most happening bars across the globe. If you have stolen out few nights for you to spend on true fun; then Dubai has scores of such places that offer you the maximum fun at the most affordable prices; and Filipino bars in Dubai, clubs and restaurants are at the top of such listing. Filipino bars offer great night fun in Dubai, eating, drinks and music at reasonable prices in Dubai. Mostly, Filipino bars are famous for their late night serving, liveliness, affordability and vivacity. You may always find Filipino bars, high at customer service and hospitality. For your opportuneness, listed below are the best 5 Filipino bars in Dubai that’s worth the visit. If you want to enjoy live music, delectable food and amazing ambiance head towards Boracay night club without thinking of an alternative. It is one of the finest Filipino bar, club and restaurant in Dubai. Boracay is one the biggest venues in Dubai. It offers a wide array of lip-smacking snacks and international cuisines and an excellent selection of electrifying cocktail and alcoholic drinks. You may enjoy live musical performances by three native musical bands every night, performances by star dancers and comedians, etc. It is located at the Asiana Hotel, Salahuddin Road – Deira Dubai. To enjoy the finest ballads in town on all seven days a week with amazing food and drinks, Kitakits Kafe & Klubb is your place to be. From amazing meals to drinks deals, this Filipino bar in Dubai is absolutely awesome. Not only this, you will also be entertained by hilarious stand-up comedy performance by native artists. Most of all, the inventive selection of drinks and cocktails at this bar will capture your heart, making your visit every day. Don’t forget to stop at Kitakits Kafe & Klubb when passing by Marco Polo Hotel, Al Muteena Street – Deira between 6:30pm -3 am. Live DJ, musical performance by bands, karaoke, pool tables and loads of neon; this place is truly happening. Manila 21 is another finest Filipino bar in Dubai, with amazing rations and stimulating drinks. This place is perfect for enjoying live music, lounge bar, night club, dance floor and late night eat. An average deal at Manila 21 comprising of a starter, main course and a drink cost you around AED 150. Manila 21 is located at Avenue Hotel, Al Rigga Road, Deira and serves between 6pm to 3am. Manila 365 is a typical Filipino centric hangout bar in Dubai, with electrifying music, dance floor and night fun options. The bar offers great snacks and meal and numerous alcoholic and on-alcoholic drinking options. The bar has captivating ambiance and attract a huge number of visitors, weekends are usually more crowded. The bar also offer happy hours discounts, ladies night and other theme fete for maximum night fun. Manila 365 is located at Ramee Hotel Abu Baker Al Siddique Rd Deira – Dubai. An amazing nightspot for refined musical performance, drinks and food Maharlika Café never mistaken making itself an attraction. You can enjoy the typical the absolute of Maharlika by ordering a hops’ pitcher and Pinoy snacks platter to get the maximum fun. The fun doubles with the amazing combo of American music and Filipino rock with splendid cocktails. Maharlika Café is located at the President Hotel, Trade Centre Road – Karama. 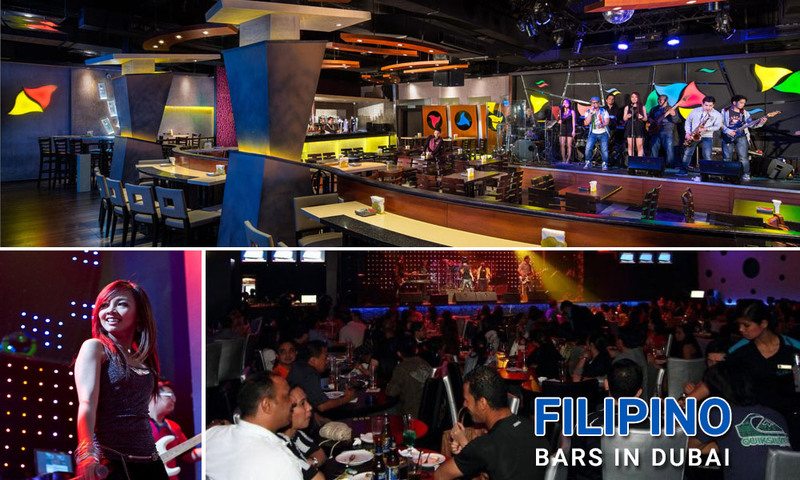 These are some of the famous and top Filipino bars in Dubai offering live music, Filipino food and loads of entertainment & fun to the visitors. If you have visited one of the above mentioned Filipino bars, please share your insights by adding comments below.